Geologically the Meghalaya plateau comprises of rocks from the oldest Precambrian gneissic complex to the Recent alluvium formations. The stratrigraphic sequence is as follows. 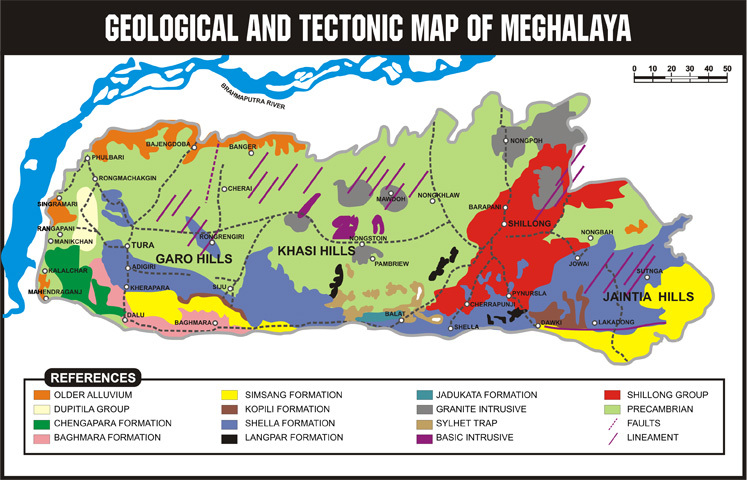 The Precambrian gneissic complex comprising para and orthogneisses, migmatites and the Shillong Group of rocks comprising mainly quartzytes are exposed in the central, eastern and northern parts of the Meghalaya plateau. They are intruded by basic and ultrabasic intrusives and late techtonic granite plutons. The lower Gondwana rocks of Permo-Carboniferous age are recognized at the western part of Garo Hills and consists of pebble bed, sandstone, and carbonaceous shale. The Sylhet trap of middle Jurassic age comprising mainly of basalt, rhyolites, acid tuffs, is exposed in a narrow E-W strip along the southern border of Khasi Hills. 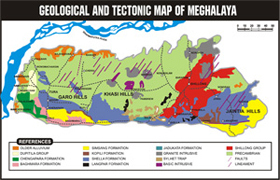 The Cretaceous – Tertiary sediments occupying southern part of the Meghalaya plateau comprises of the Khasi Group (arenaceous facies), the Jaintia Group (calcareous facies) and the youngest formation the Garo Group which is represented as Simsang, Bagmara and Chengapara formations. Besides these the Dupi Tilla group of mid-Pliocene age occurs in the western part of Garo Hills and towards south of Khasi Hills. Isolated patches of older Alluvium overlie the Tertiary rocks along the southern and western borders of the State. The recent Alluvium formation is mostly found in the river valleys of Garo & Khasi Hills Districts.